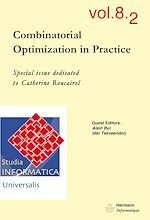 This special issue of Studia Informatica Universalis is dedicated to Catherine Roucairol, Professor Emerita at the Université de Versailles Saint-Quentin-en-Yvelines. Throughout her distinguished career, Professor Roucairol has made fundamental and pro found contributions to the fields of optimization, computing parallelization and operations research. This special issue consists of twelve papers, that covers some of the topics to which Professor Catherine Roucairol has contributed.